Converted to exacting standards throughout following a programme of renovation commenced in 2017, this fabulous cottage has skilfully retained a host of character features that combine harmoniously with the modern contemporary fittings to create this superb unique home. A pitched tiled entrance porch with lantern light and front door leads into the hall, a staircase with central stair carpet rises from here to the first floor. Natural limestone flagstone flooring with underfloor heating flows through the hall, kitchen/dining room, utility room and cloakroom. The downstairs cloakroom is fitted with a white ‘Heritage’ suite as is all sanitary ware throughout the cottage. The 25’ x 9’1 kitchen/dining room is comprehensively fitted with bespoke hand built units in 'French Grey Dark' colour with contrasting solid quartz worktops and returns. A butler sink sits under the window overlooking the rear garden with a further window and set of double doors leading out to the rear terrace. The dining area has a vaulted ceiling, set of double doors to the hall and a cast iron gas fired stove sits snugly in one corner. The utility room offers additional storage solutions with a further enamelled sink, kitchen units and large built-in cupboards with space and plumbing within for washing machine, tumble dryer and other domestic appliance. The sitting room is double aspect, has a beamed and vaulted ceiling and a cream coloured cast iron ‘Stovax’ log burner as the focal point for the room. 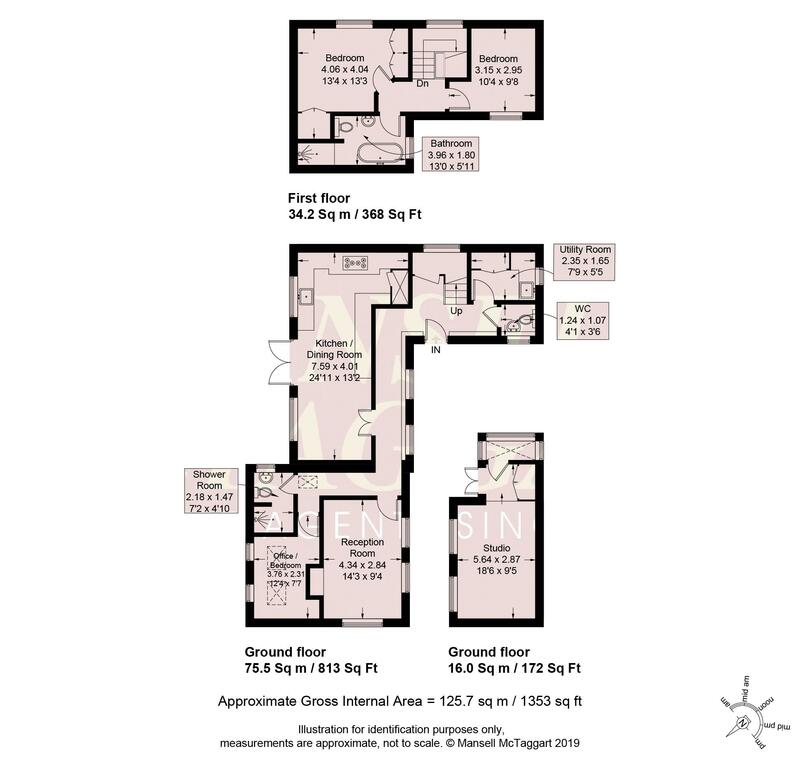 There is a study on the ground floor that is fitted with office furniture but could be adapted to become a ground floor bedroom if required, adjoining this room (accessed from the hall) is a shower room/WC with a large oversized shower cubicle. On the first floor a small landing accesses all rooms. The principal bedroom has a high vaulted ceiling, built-in wardrobe/storage cupboards and some high level cupboards one of which holds the gas fired boiler. The second bedroom is also a double and includes the loft access. The family bathroom is stunning, with roll top free standing bathtub and a large separate oversized shower cubicle with twin headed shower. Outside, brick pillars with finials and a curved brick wall access the parking/hardstanding for two cars, the front garden is landscaped and well stocked around a shaped lawn with central specimen tree. The rear gardens like the front are landscaped, measure 55’ x 40’ with a sandstone patio adjoining the property, brick retaining walls and steps lead up to a shaped lawn with surrounding pathways, ornamental water feature and sleeper edged stocked planters. A substantial outbuilding/games room 18’6 x 9’6 with light/power and electric heating with built-in storage, a glazed area for use as a potting shed/glasshouse. A lovely rural setting surrounded by open countryside without being isolated. By car Gatwick Airport 20 mins, City of Brighton & Hove 15 mins. From our office proceed west and at the Stonepound Crossroads head straight across following the B2116 into Hurstpierpoint. Passing through the village High Street and at the mini roundabout go straight over and follow the Albourne Road for approximately half a mile and turn right into Langton Lane following the lane until you reach the T-Junction, the property can then be found on the right hand side. Calor gas fired heating with a sunken tank within the rear garden – shared private drainage system for Cobbs Mill. Ground floor study / bedroom 3 with adjoining shower room/WC Two first floor double bedrooms the master having a comprehensive range of built in wardrobe/storage cupboards.